When entertaining brings you down, reach for these Cranberry, Brie & Toasted Pistachio Phyllo Bites to lift you up. These bite-sized appetizers come together in 10 short minutes but taste like it took you all day. I’m not sure about you, but I prefer to enjoy the party I’m hosting rather than fussing over food. I love spending time in the kitchen but not when my house is busting at the seams with family and friends. I prefer to spend my time mingling with a cocktail glass in one hand and snack plate in the other. In order to keep my sanity intact during the holiday season, I always choose recipes that come together easily and require little effort on my part. I like make-ahead recipes that I can pull out the day of the party and throw-together appetizers like these Cranberry, Brie, & Toasted Pistachio Phyllo Cups. This recipe calls for four simple ingredients and 10 short minutes to prepare them. I hate to admit that I cheated, but I kind of did with this recipe. I snagged a box of prepared phyllo cups from the freezer section and filled them with buttery brie and store-bought cranberry sauce. To add a bit of crunch, I added a sprinkle of toasted pistachios. No cooking, baking, or heavy manual labor required. If that doesn’t get you excited, I don’t know what will. I like to fake out my guests by serving up simple food on fancy serving piecing. It will impress the pants off your guests and have them feeling extra generous since it will appear as if you put forth an extreme amount of effort to make everything look festive. I used the help from Restaurantware to fancy up my holiday table this year. I’m currently loving the wooden board in the photo above. It’s a classic piece that will never go out of style and perfect for any occasion. Since wine always makes an appearance at my holiday parties, I like to serve it in something a bit more decorative than the wine bottle, so I went with a sturdy glass carafe. For a decorative touch, I couldn’t resist adding a few vibrant handfuls of fresh cranberries to the cute little fry basket. Your guests will be complimenting your table attire the entire length of the party. If you’re looking for a few more quick holiday appetizer recipes, try this Caramelized Onion & Mushroom Crostini, Sun-Dried Tomato & Roasted Red Pepper Hummus, and Mini Polenta Pizza Bites. Crunchy phyllo cups get filled with ultra buttery Brie, sweet cranberry sauce and toasted pistachios. This appetizer recipe is perfect for entertaining and only takes 10 minutes to put together. Fill each mini shell with a small wedge of Brie. Top each piece of Brie with 1 teaspoon of cranberry sauce. Sprinkle each shell with the toasted pistachios. Serve. Disclosure: This recipe was developed for the folks at Restaurantware. All opinions are my own. Thank you for supporting my recipes and site while I work with brands I adore. Great minds, friend! I totally made something almost exactly the same recently :) And I am LOVING that board! Off to check out Restaurantware! I’m not sure what gets me more excited about this post, your delicious phyllo bites or that gorgeous serving board!! Such a great party app, and I love the shortcuts! Plus cranberry + pistachio is a flavor combo that can’t be beat, especially at this time of year! 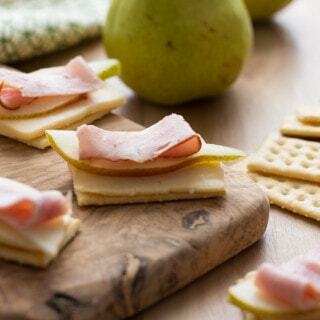 I love easy for party appetizers. These look perfect! That wooden board is definitely fantastic! So pretty! And I love how easy these bites are – simple dishes are all I can manage right now!! MAKE AHEAD! It’s the only way to go for party appetizers, I’m with you. I love your styling for these photos Jennie! Love the wooden slab thingie whatever you call it! So pretty! These mini apps are dangerous because I could easily eat them all! When it looks as good as this, it’s totally okay to cheat once in awhile. Plus brie, cranberry and phyllo – I’d eat them right up! What a pretty and elegant appetizer for entertaining! Those little phyllo cups are one of my favorite tricks for easy entertaining. And I’m a firm believer in easy snacks with a beautiful presentation. You’ve nailed it! I have my eye on that big round slab, too. It’s so gorgeous! I work for the Fillo Factory, on their website, etc and I can honestly say phyllo cups are a favorite of mine! I’m always looking for new and fun stuff to do with them. Jennie if you ever run out of ideas for what to put into cups, I’ve been working on my recipe blog, All Things Fillo. Maybe we can collaborate some day.